Handler throws a glove over a high/bar jump and heels with the dog before sending the dog to retrieve the glove, after which the dog catches up to handler and continues to heel before handler takes glove. Purpose: Demonstrate cue discrimination and the ability to hold an object while jumping and heeling. Equipment: Glove, high/bar jump set at appropriate height for dog. Exercise set-up: Handler starts by holding a glove with the dog in heel position (sit or stand at heel is acceptable but should be consistent throughout the level) in front of the jump. The exercise begins when handler cues the dog to stay (single verbal and/or hand signal) and throws the glove approximately 10 ft. (3 m), over the jump. The handler then gives a single verbal and/or hand signal for a left or right about turn and heels with the dog directly away from the jump for 5-10 paces, followed by another about turn (opposite direction of the first one), and heels back toward the jump. 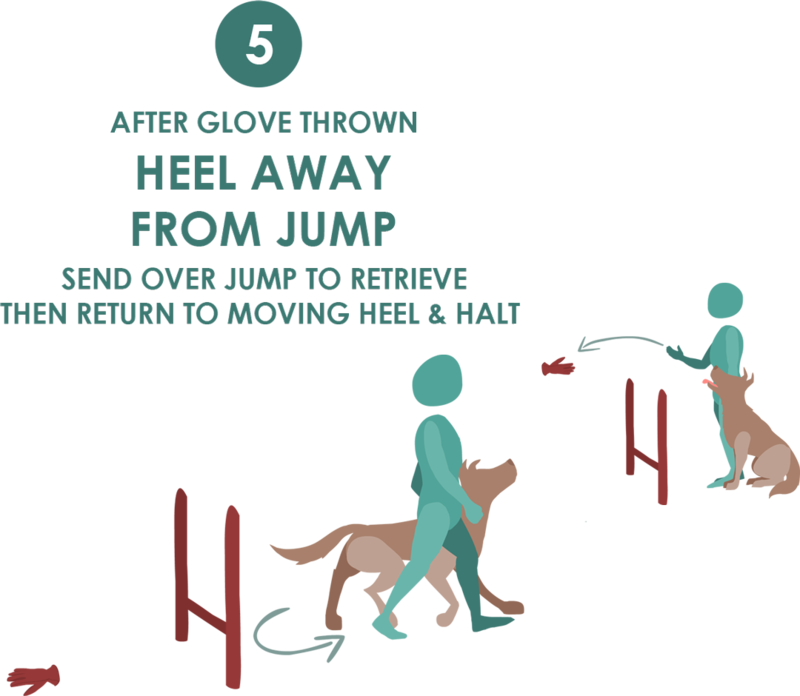 When the handler is approximately 5-10 ft. (1.5–3 m ) from the jump, and while still in motion, the dog will be cued with a single verbal and/or hand signal to go over the jump, fetch the glove, and return over the jump. When the dog is cued to take the jump, the handler will turn 180 degrees and walk away so, when the dog returns over the jump, he/she has to catch up and fall into heel position with the moving handler. A single verbal and/or hand signal may be given to the dog while catching up to the handler. Dog must take the jump on the return without an additional cue. The team will then heel 5-10 more steps before coming to a halt, at which point the handler will cue the dog to release the glove to hand (single verbal and/or hand signal). The exercise ends when the dog has given the glove to the handler. Non-qualifiers: Dog attempts to fetch the glove before being cued or does not fetch the glove on cue. Dog does not go over the jump in either direction. Dog does not heel with the handler after fetching the glove. Dog drops the glove before the end of the exercise. Dog drops the bar (if a bar jump is used). Handler gives additional cue when dog is returning back over the jump with the glove. Video does not permit the exercise to be adequately judged. Tip: Consider doing a left-about turn first, to aid the dog in moving away from the jump.